Left; Tom Kendall aged 26 pictured in a collage of Australian Test Cricketers in 1878 at Chuck Photography Ballarat. See Thomas Henry Chuck. 1874 Kendall named in team to play Albert Park at Royal Park on 22nd. August, and against St.Kilda at the St.Kilda ground on 12th. September. 1874 Tom Kendall mentioned as one of the star players for the year 1874. 1875 Has developed into a grand back player. 1877 ("The famous trundler") Gave promise of becoming a sturdy player, full of activity, and a decent kick. 1880 Kendall was playing for Tasmanian club Oatlands against the City club as a defender, July 24. 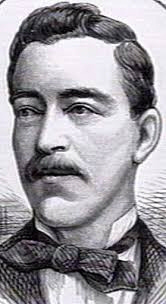 Tom Kendall played 2 Test Matches for Australia in 1877. He played Test Cricket before playing a first class game. Kendall played in the very First Test Match at the M.C.G. against England, March 15-19 1877. Last wicket stand by Kendall and Hodges adding 29 valuable runs. England required 154 runs for victory. England's first wicket fell without a run on the board, and a steady procession of batsmen followed as left arm slow blower Kendall broke through time and time again. Second Test M.C.G. March 31-April 4. England won by 4 wickets. Perhaps the best Australian bowler who never went to England. 1874. Had W.G. Grace caught off his bowling for 8 in Melbourne. 1892. Bowled W.G. Grace for 27 in Hobart. Two Test Matches 1877, both in Melbourne. One 5 wicket innings. Best 7/55. Other Carlton Football Club players to have played Test Cricket for Australia are Harry F. Boyle , George Coulthard and Jack Conway was an Australian Cricket Team manager. Contributors to this page: Jarusa , blueycarlton and pblue . Page last modified on Thursday 03 of August, 2017 12:31:26 AEST by Jarusa. 1992 Rd 6 - Darren Tarczon. 1969 Reserves 1st Semi - Team List & Selections.